Nestled in the heart of Seo-myeon, Rainbow Pension is an ideal spot from which to discover Namhae-gun. From here, guests can enjoy easy access to all that the lively city has to offer. With its convenient location, the hotel offers easy access to the city's must-see destinations. At Rainbow Pension, the excellent service and superior facilities make for an unforgettable stay. The hotel provides free Wi-Fi in all rooms, car park, pets allowed to ensure our guests the greatest comfort. The hotel features 10 beautifully appointed guest rooms, many of which include television LCD/plasma screen, internet access – wireless, internet access – wireless (complimentary), air conditioning, balcony/terrace. Besides, the hotel's host of recreational offerings ensures you have plenty to do during your stay. 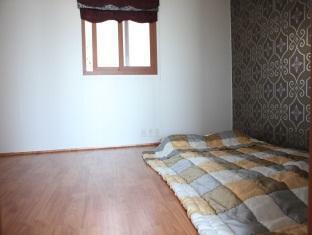 Superb facilities and an excellent location make the Rainbow Pension the perfect base from which to enjoy your stay in Namhae-gun. There is no easy way to actually get to water, and the attractions you'd probably heard of are on the other side of the isle. Most of the issues that blocked me could be solved, however, if you had someone who drove. The rooms seem small to me, though have no background with these kind of pensions. The cost per night, to me, seems should have been lower for what it offered. Will say the on-site managers were accommodating when able and friendly. Bring food for cooking on arrival, also, as the nearest food mart is almost 4 KM south of the site. No wi-fi, no pickup service, bad location, even in the room cellular phone didn't working. Worst pension I ever have been in. In order to reach Rainbow Pension, you have to take a ferry boat to Namhae Island and then a taxi ride to the pension itself. This adds another per day (+$15 per additional person) as well as an additional hour for the travel time per direction (not to mention the waiting). The ferry is fun for those who have time, but once on the island there isn't much to do. The owner of the pension acted as our taxi, but was unwilling to drive us to get basic things such as food(!!). There are facilities to cook once you get to the pension, but you have to buy the food in advance, from someplace else. There are more convenient, and cheaper, places to stay, unless Namhae is the destination you intend. I would suggest that you go once, but prepare well in advance. Pretend it is a camping trip where you have to bring everything but the tent and sleeping bags. The view was amazing, Very clean if you want to unplug and get away from it this is the place!! The manger was wonderful and went out of his way for us. Clean and roomy loved that you have a place to cook. The dining areas outside give you a lovely view. Beds are very hard, so be prepared for that, but then again most hotels we have found in South Korea are like this. over-all it was good, this place is appropriate for couple and family because you can cook in the room. Nice overlooking view of the sea, fresh air and quiet surroundings. However, there is no wifi as stated in the description.The manager offered transportation service.